Situated in the fashionable and historic De Waterkant village this spacious property offers open plan living on 140 sqm. Enjoy a village atmosphere with a taste of old Cape lifestyle – quiet tree lined streets, quaint outdoor café’s, excellent restaurants, art galleries, boutiques, antique shops and the Cape Quarter shopping centre are just around the corner. A spiral staircase leads onto a private wooden roof deck with 360° views of Table Mountain, the Atlantic Seaboard and Signal Hill – a perfect and safe location from which to explore the magnificent city of Cape Town. The cottage is within easy reach of the City Centre, the V&A Waterfront, and some of Cape Town’s finest beaches. * Situated close to Cape Towns best Restaurants, clubs and bars. What a wonderful apartment this is! As a single female traveler, I stayed in this place and loved every minute of the accommodation, the neighbourhood, and Lloyd and his staff. I highly recommend this place to people who like a certain degree of luxury, but want to be independent. My only regret is that I could not stay longer than a week! 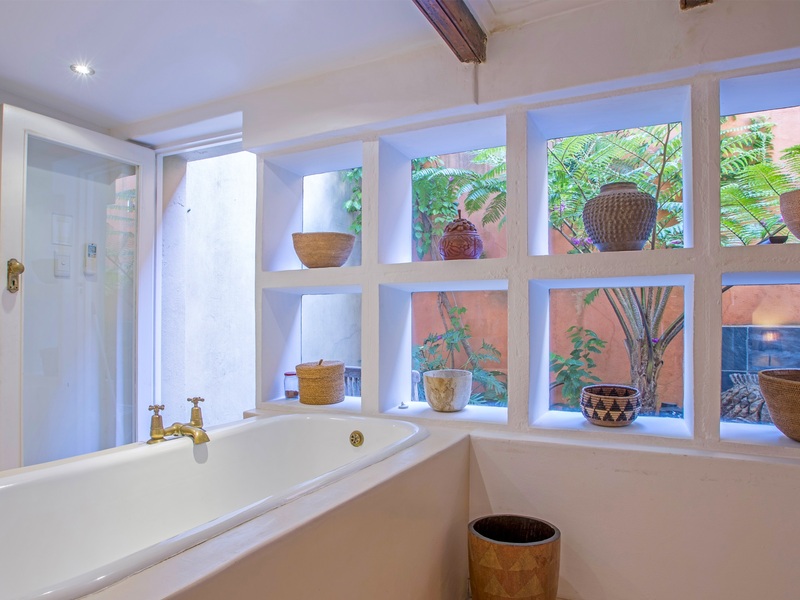 Great big house for 2 persons, nicely decorated in african style and good equipped, quiet and perfectly located in Waterkant area. It has a nice roof terrace. We can recommand it !!!!! I loved staying at 80 Waterkant Street – the location is very central yet quiet, ideal for gay tourists as well as it’s walking distance to most gay bars. The place is very spacious for two people and the rooftop sports great views of Table Mountain. Another great thing is the cleaner coming every second days or so. Recommended!